Have you ever wonder how the Swans did on a particular date in history or wondered which league or competition they played in? Well read on to find out exactly what happened, wherever and whenever the Swans played on 23rd November. 3 years ago in 2013 – Substitute Jonjo Shelvey came off the bench to score the Swans winner in the 2-1 victory over Fulham at Craven Cottage in the Barclays Premier League. An own goal from Aaron Hughes set the Swans on their way to a first win in 6 games, which moved Michael Laudrup’s men up to 10th place in the table. 14 years ago in 2002 – A sparse crowd of 2,886 watched bottom of the table Swansea City lose 2 nil to Scunthorpe United at Glanford Park in Nationwide League Division Three. Manager Brian Flynn handed debuts to Manchester United loan defender Alan Tate and Blackburn Rovers loan striker Marc Richards. 15 years ago in 2001 – The Swans lost 1-0 to Hartlepool United at the Vetch Field in Nationwide League Division Three. The 4,181 crowd watched the Swans dominate the game without making their superiority count and things went from bad to worse when Kris O’Leary was sent off late in the second half – his third sending off of the season. 17 years ago in 1999 – The highlight for the 3,748 faithful at the Vetch Field for the Swans drab 0-0 draw with Darlington in Nationwide Football League Division Three, was Walter Boyd writing himself into the history books by getting sent off just 57 seconds after coming on as a substitute for Jonathan Coates in the 85th minute. 20 years ago in 1996 – A second half goal from Lee Jenkins goal gave the Swans all 3 points as they won 1 nil at Scarborough in Nationwide Football League Division Three. In truth the scoreline should have been more flattering with the home team playing with just nine men after two sendings off 8 minutes into the game. 23 years ago in 1993 – Non-league Beazer Homes side Nuneaton Borough dumped the Swans out of the FA Cup with a 2-1 victory after extra-time in this 1st Round Replay. Steve Torpey had given the League Division Two side the lead after just 7 minutes, but Frank Burrows men were taken to extra time thanks to a late equaliser. John Cornforth saw his extra-time penalty saved as Nuneaton grabbed a 98th minute winner. 25 years ago in 1991 – A John Williams hat-trick along with goals from Joey Beauchamp, Andy Legg and Jimmy Gilligan saw the Swans romp to a 6-4 win at Bradford City in Barclays League Division Three. It was Williams’ first football league hat-trick and was all the more remarkable as the Swans had previously gone over 13 hours without scoring a goal on their travels! 28 years ago in 1988 – Merthyr Tydful lost 3-0 to the Barclays League Division Three Swans in the Welsh Cup 3rd Round at Penydarren Park. Terry Yorath’s team put on a professional performance for the 3,546 crowd with goals from Andrew Melville, Bryan Wade and Chris Coleman. 31 years ago in 1985 – The Swans lost 3-1 at the Vetch Field against Bristol City in Canon League Division Three. The Swans whom had appealed to the football league to postpone the game, due to a spate of illness and injury to the squad, took the lead through Chris Harrison, but John Bond’s men couldn’t hold on. 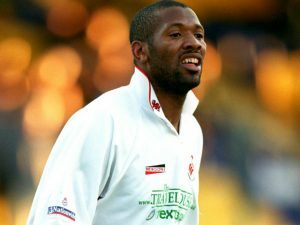 Right-back Kevin Budd was handed a debut in his one and only ever appearance for the Swans. 41 years ago in 1975 – Former Swansea City and Wales defender Christian Edwards was born in Caerphilly. 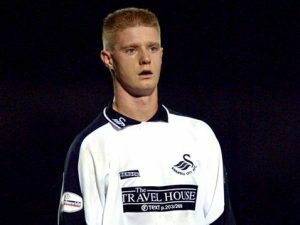 Edwards who started his professional career with the Swans, making his debut against Rhyl in the Welsh Cup in December 1994, went on to make 112 appearances for the club before moving to Nottingham Forest for £175,000 in March 1998.